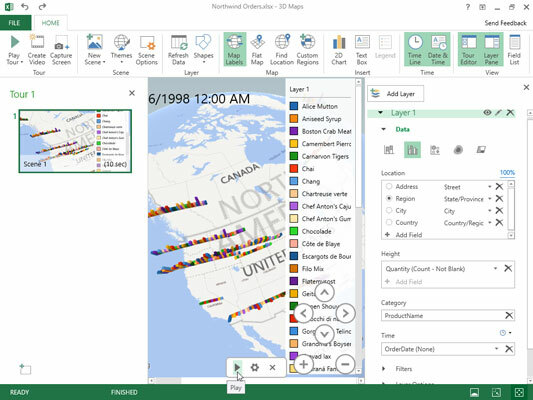 Power Map is the name of an exciting new visual analysis feature in Excel 2016 that enables you to use geographical, financial, and other types of data along with date and time fields in your Excel data model to create animated 3-D map tours. Open the worksheet that contains the data for which you want to create the new Power Map animation. Position the cell cursor in one of the cells in the data list and then click Insert→Map→Open Power Map (Alt+NSMO) on the Excel Ribbon. Excel opens a Power Map window with a new Tour (named Tour 1) with its own Ribbon with a single Home tab similar to the one shown here. Power Map window with new Clustered Column 3-D animation for visualizing the quantities ordered of various Northwind items between July1996 and May 1998 at various locations in western Canada and United States. This window is divided into three panes. The Layer pane on the right contains an outline of the default Layer 1 with three areas: Data, Filters, and Layer Options. The Data area in the Layer Pane is automatically expanded to display a Location, Height, Category, and Time list box. The central pane contains a 3-D globe on which your data will be mapped. A floating Field List containing fields in the selected Excel data model initially appears over this 3-D globe. The left Tour Editor pane contains thumbnails of all the tours and their scenes animated for your data model in Power Map (by default, there is just one scene marked Scene 1 when you create your first tour). Drag fields from the floating Field List to the Location, Height, Category, and Time list boxes in the Layer Pane to build your map. Drag the geographical fields whose location data are to be represented visually on the globe map and drop them into the Location list box in the Layer Pane. Power Map displays data points for each location field for your animation on the 3-D globe as you drop it into the Location list box. The program associates the selected location field with a geographical type in the drop-down list box to the right of the field name in the Location list box in the Layer pane. You can modify the type by selecting its drop-down button, if necessary. Just keep in mind that each location field needs to have a unique geographical type. You also add fields from the floating Field List that you want depicted in the animation to the Height, Size, or Value list boxes (depending upon the type of visualization selected). Select the type of visualization by clicking its icon under the Data heading in the Layer Pane: Stacked Column (default), Clustered Column, Bubble, Heat Map, or Region. Power Map now displays data points for your Height, Size, or Value data on the 3-D globe appropriate to the type of visualization selected along with a floating legend for the data values (organized by any fields used as categories) in the center pane of the Power Map window. At the bottom of the map, you see a Time Line control with a play button that enables you to play and control the animation. (Optional) Click the Map Labels button on the Ribbon to add country and city names to the maps on your 3-D globe. (Optional) Click the Close the Layer Pane button and Close the Tour Editor button to hide the display of Layer and Tour Editor panes, respectively. Now, your 3-D globe with the Layer 1 legend on the right side and animation timeline below fill the entire window below the Power Map Ribbon. Note that you can redisplay the Layer pane and the Tour Editor pane in the Power Map window at any time by clicking the Layer Pane or Tour Editor Ribbon buttons, respectively. (Optional) Drag the Layer 1 legend so that it’s not obstructing your 3-D globe. You can also resize the legend by selecting it and then dragging its sizing handles. If the Time Line animation control is obstructing key areas of the globe, you can hide it by clicking its Close button. You can redisplay the Time Line control at any time by clicking the Time Line button in the Time group on the Power Map Ribbon. Note that you can’t reposition or resize the Time Line control when it is displayed and that you can play your animation by clicking the Play Tour button on the Ribbon when the Time Line control is hidden. (Optional) Drag the globe to display the area of the world with the locations you want to watch when you play your animation or use the Rotate Left, Rotate Right, Tilt Up, or Tilt Down buttons to bring this area into view. Then, click the Zoom In (Shift+ +) or Zoom Out (Shift + –) to bring the area closer into view or further away. Once you have the viewing window beneath the Power Map Ribbon positioned the way you want it when viewing your animation, you are ready to play the 3-D map tour you’ve created. Click the Play Tour button on the Ribbon or the Play button on the Time Line control (if it’s still visible). When you click the Play Tour button on the Ribbon, Power Map automatically hides the Tour Editor and Layer pane along with the Time Line control if they are still visible at that time. You can pause the animation by clicking the Pause button that appears in a cluster of controllers in a bar at the bottom of the screen or by pressing the spacebar on your keyboard. When you’re finished watching the animation, return to the regular editing view of Power Map by clicking the Go Back to Edit View button (the one with the arrow pointing left at the very beginning of the bar at the bottom of the screen) or press the Esc key on your keyboard. Click the Close button in the far right corner of the Power Map title bar to close Power Map and return to your Excel worksheet and then save the workbook (Ctrl+S) to save your Power Map tour as part of the workbook file. After you create your initial animation tour for the data model in your Excel workbook, you can always replay it simply by reopening it in Power Map and clicking Play Tour on its Ribbon. To reopen the tour when the workbook with the data model is open in Excel, select Insert→Map→Open Power Map on the Excel Ribbon (Alt+NSMO) and then click the Tour 1 button at the top of the Launch Power Map dialog box.